Bluetech Finland Ltd has won the contract to deliver full scopes for both structural basic design and structural production detail design for an entire newbuilding ropax ferry. It will be built by Rauma Marine Constructions Ltd (RMC) in their Rauma shipyard for Danish shipowner Mols-­Linie A/S. The ship is 158 meters long and has a cargo capacity of 1500 lane meters. 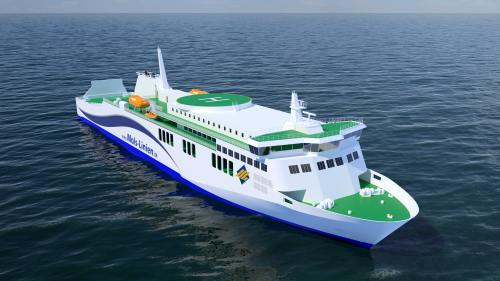 It is designed to carry cargo and passengers on the route between the Danish islands Bornholm and Sjaelland on the southern Baltic sea. Bluetech Finland has previously successfully delivered structural basic and detail designs for RMC’s earlier new building projects such as a floating luxury accommodation unit and the “North Deck” platform, which was annexed to Dubai’s renowned Burj Al Arab hotel earlier this year. This design contract is a significant milestone for Bluetech Finland on its route to a significant player in the international ship design market. Bluetech’s scope is central to the whole building process and as such shows confidence on our capability. “Winning this contract proves that our services are highly esteemed and our previous deliveries have been successful”, says Mr Petri Hakulinen, Chairman and Director of Business Development at Bluetech Finland. Rauma Marine Constructions Ltd published a news flash on their new building order earlier. Mols­-Linien has published a press release about their new contract on the route to Bornholm.